Keep your first-aid cabinet well stocked with these Medi-First 60612 sterile gauze pads. From busy chefs trying to keep up with a busy dinner rush to students racing around on the playground, injuries are bound to happen. Super absorbent, these pads are perfect for use as a wet absorbent dressing, capable of treating burns, cuts, and abrasions that can occur in any busy environment. The sterile 2x2 gauze pads are perfect for staunching and bandaging small to medium sized cuts, burns and scrapes. One could not put together a complete first aide kit without them. These gauze pads by medi-first are the best gauze pads i have ever used! They are affordable, a great value, and packaged beautifully. Would order again. Nice, thick, and very comfortable gauze pads, and sticks very nicely to medical adhesive tape. A must have for any first aid kit, especially at this price! It is so important to have gauze pads and these are a great size with 10 per box. The cost is low and the product works well. 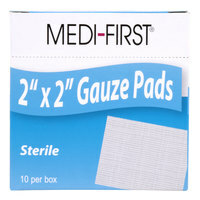 The medi first 2x2 gauze pads are excellent for smaller wounds and cuts! They are easy to cover with a bandaid and even keep the wounds dry and help heal them faster! perfect sized for little lacerations and flaps, and all the little nicks that happen in a commercial kitchen. They are available here at an everyday price. These latex-free, sterile gauze pads are a perfect size (2 x 2 inches) for any typical knife cuts you might have happen in the restaurant. Highly recommend this addition in your first aid kit. Amazing product. I love these 10 x 10 Gauze pads. I keep them in my first aide kit at home and in my kitchen it work. Super handy to have around I highly recommend for any first aid kit. Ten to a box, this Medi-First brand box of sterile 2x2 inch pads is an economical purchase. These pads are individually wrapped, and they are absorbent. These little gauze pads are an excellent product. They are small at 2 inch by 2 inch but patch a few together and you could get some good coverage if needed. These are a fairly standard gauze pads They're sized for injuries that are a bit too large for your typical adhesive bandage. They come in box of 10 individually wrapped gauze packs, so that you can refill a large first aid kit or multiple smaller ones. They are solid quality, but where they shine brightest is their price, which is so low as to be nearly unbelievable. these small gauze pads are great for small scrapes, cuts and abrasions. it's very handy to have extra gauze pads in your first aid kit in case of an accident or emergency. these gauze pads are perfect for small abrasions. They aren't super large so they can be fit under a bandage. They are very absorbent and wick away moisture. These gauze pads can be used for a lot of first aid situations. They'e especially good at covering up minor wounds if you don't have a band aid. This box includes 10 individually wrapped gauze pads. They're perfect for treating minor wounds and cuts. A fine (and affordable) addition to your first aid kit. Great quality gauze pads with this product. I much prefer using gauze to bandaids as it is much healthier for the wound to get air. This is a must have product! I love being able to buy things like this on here, a lot of sites don't have it, I can buy first aid kits, etc its nice. The ten count box of Medique Medi-First two inch by two inch Sterile Gauze Pads is a must for every kitchen, restaurant and household. They are great for wrapping fresh knife cuts and burns and they are very absorbent. They are also great at protecting existing injuries from contaminating foods during service. I would highly recommend. Small 2"x2" gauge pads, 10 in a box these medique medi-first gauze pads are always nice for when you have minor cuts and scrapes your trying to keep clean and covered! I purchased the Medi-First 60612 Sterile 2" x 2" Gauze Pads for my first aid kit. I use guaze everyday so this will definitely come in handy. The quality is good and the price is even better. Highly recommend! These are the exact same thing as the name brand versions. I like the products from Medique since you can buy medical products in small amounts practical for average consumers. great gauze pads, with many uses, but good to have on hand for times of need, especially if someone is hurt! 2x2 and works great! The Medi-First 60612 Sterile 2" x 2" Gauze Pads - 10/Box is a great addition to your first aid kit. They are a great price! I love this product! It's important to have these handy at home and at the job! They are sterile 2"x2" gauze pads! Good size for small minor injuries. It has a perfect size to cover up small affected areas when needed. It has a low cost and Its a must in a medical box. I would recommend this to anyone! These gauze pads are super cheap and work very well. They're very absorbent. At this price, you can afford to keep a bunch in your first aid kid. Great bargain. These small gauze pads are great for small injuries in the kitchen. I recommend to always keep some of these in your first aid kit. Nice price for gauze pads. I like that it is a nice, small box of gauze pads, so that way I can get a box for each first aid kit. These are very handy to have by. I keep a couple in my fist aid kit, as well as my glove box in my car. I would recommend. This is a large box of gauze pads for a very affordable price. Each pad comes individually wrapped and these are absolutely indispensable in any first aid kit. Excellent product at a excellent price. My mom is a retired registered nurse of 30 years and is very picky of what she uses. She wanted to know where i bought this and i told her. She was astonished at how much it cost. Me and my family will continue to purchase and use this product. This is a really great price point for this ten pack of gauze pads. We purchase them when we need to replenish our first aid kit. These gauzes are very absorbent and they also work great at protecting wounds from bacteria. The price is great for the amount in the box. These sterile gauze pads come in handy when the wound is too large for a normal bandage. It can be used in conjunction with medical tape. These medi first sterile gauze pads work just as good as the more well known brands and at such a better price. These are a great addition to any first aid kit. perfect item when re-stocking our food safety first aid kits. These are necessary for the more serious injuries. Great price in comparison to elsewhere. Its great that WS offers many sizes of gauze. We keep them on hand a-plenty as we deal with a lot of equipment and should something happen we want to be prepared. Gauze soak up a lot of fluids and keep dirt out of any wounds. The Medi-First 60612 Sterile 2" x 2" Gauze Pads - 10 / Box are great to keep in my purse with my other emergency first aid items. It is easy to open and I can have it readily available for anything. Fast shipping as well. It arrived early. Works extremely well with the medical tape that we have ordered in the past. Easy to apply and soak up any excess moisture needed, as well as protect the area. I highly recommend always having gauze on hand and 2x2 is generally big enough for any cut or wound. Nice gauze pads to have in first aid kit to put over wound and keep on with tape. I prefer non stick sterile pads as they don't absorb blood and stick to wounds. Otherwise decent product. These Medi-First sterile gauze pads were a nice find for us. They are just as good as the ones we were getting from the drug store, at about one-third of the cost. Medi-First Sterile 2" x 2" Gauze Pads box of 10 are the perfect addition to every first aid case. A great size for wounds that need something larger then a band aid. Priced well. These pads are a great addition to a first aid kit when more than a sticky bandage is needed. The precut size prevents waste and is a good size many needs.